You may have noticed that the lights at the P&G / Gillette plant were recently made much brighter and went from yellow to white. The lights are not shielded and shine into a number of people's windows. I've contacted P&G about it and will post updates as they come. Please add a comment if it affects you or you have information. 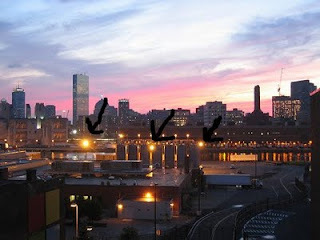 I talked with the community liason at P&G, Brian, told him the problem and sent him a photo with the lights. He said the firm that manages the lights for them switched to higher output bulbs. He's seeing if they can find a way to re-orient the fixtures so they're pointing down or turn them off. I will update this post with the info. Gillette / P&G has turned off those lights. I'd like to thank them for listening to the community. Drew - check your email.